I was lucky enough to attend my first Adventure Travel World Summit in Anchorage in September, and what a trip it was — full of incredible people, ideas and conversations. Coming from the non-profit rather than tourism world, it was a huge learning experience for me. The ATTA and its members play a critical role in pushing for responsible stewardship of our planet through support for sustainable tourism. I knew before I landed that accountability and corruption issues were a massive problem in the tourism industry. I’ve seen that first hand in the parts of South Asia and West Africa that we work, whether it be permits changing hands illegally, contracts awarded without due process or sub-standard infrastructure as a result of corrupt management. At the Accountability Lab, we support young people with creative ideas for building integrity and fighting corruption. We know that unless we can address these challenges, it will be very hard to do business, deliver services or ensure inclusive decision-making. And that matters for all of us. Sheer scale. The tourism industry now accounts for an estimated 6% of the world’s exports, or nearly $1.3 trillion in GDP. That is much more than the world spends on aid to developing countries. At the same time, it has been shown that a 1% reduction in corruption in a given country increases tourist inflows by 2-7%. With these sorts of figures, the economic gains that are possible through more coherent efforts to fight corruption in tourism simply can’t be ignored- they could transform millions of lives around the world. Lack of information. Despite the size of the industry and the indication from every ATWS participant I spoke to that they deal with accountability issues of some sort every day, integrity and corruption issues within tourism are surprisingly under-studied. Conversations in Anchorage made it very clear that tour operators, industry representatives and government officials all want further guidance on how to improve transparency, minimize graft and make decision-making more accountable. This requires initial efforts to understand the challenges in a more coherent way, followed by clear, practical suggestions for how to build change. In one of our sessions for example, we talked through how to instill values among staff and partners as a starting point for further accountability initiatives. Collaborative mindsets. As a newcomer to ATWS, I was particularly impressed by the openness to discuss these issues, which are not always easy to talk about. There are many industry conferences where the same challenges exist but sadly go unmentioned. Equally, in the sessions around building integrity, there was a real sense of collaboration and cooperation among the participants for sharing ideas, finding common ground and thinking through practical next steps. There are a number of joint initiatives in other sectors that have improved transparency and accountability- like Publish What You Pay and the Extractive Industries Transparency Initiative (EITI). There seems to be fertile ground for something similar in tourism. Demographic dividend. The adventure travel world and the ATTA is by its nature driven by young people and the young at heart, which is only a good thing. This reflects larger trends – now, over 50% of the global population is under the age of 35 and by 2025 millennials will represent 75% of the global workforce (and potential tourists). This generation looks for a combination of interest, money and social value in their jobs and industries that want to stay relevant must get ahead of the curve. Lack of transparency and accountability in business simply won’t fly with youth today, and tourism has the perfect opportunity to show how it is setting new standards around these issues. Long-term mindsets. It was incredible to hear about some of the impressive environmental sustainability efforts being led by ATTA members, which are protecting critical ecosystems for future generations. This approach will serve the tourism industry well as it thinks through accountability challenges for which there are no short-term solutions. We have to think about this in the same way we think about the environment — as a sustained effort to change mindsets and behaviors over time, through new rules, creative approaches and continued awareness raising. Tourism companies that value accountability improve lives, are better corporate citizens, make more money, are more attractive to potential employees and investors, and are more likely to create the stability they need to operate effectively over time. Addressing the challenges outlined above is not easy, but the ATTA is in a unique position to do so. 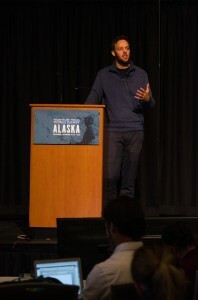 My call to action on the last day in Alaska was: Go big, be bold and build accountability. I can’t think of anything more important. Part of the Lab’s work includes “Social Impact Tours” in South Asia and West Africa – contact Blair at [email protected] for more details and follow the Lab on Twitter @accountlab.